Gee, I didn’t realise how long it had been since I’d posted here on my blog. I’ve been busy elsewhere with various things. Lately, I’ve been reading a lot about buying and selling websites. It’s not really something I do a lot of myself, although I dabble in it. Even so, I wanted to gain a better understanding of what’s involved so I’ve been looking at a wide range of material. Some of the info available online is high quality and, needless to say, some of it isn’t. Sadly it’s often the ‘names’ and the ‘gurus’ who are selling the real low-end stuff. Let’s have a look at one of these today. Usually when I do a book review, such as the most recent one I did – Morris Rosenthal’s excellent book about copyright infringement – I spend some time reading the book, thinking about it and crafting a blog post to evaluate and review it. Frankly, it’s just not worth the time and effort in this case. If I’d not already been somewhat desensitised to MMO gurus and snake oil (buy my book), I would have been quite shocked at what some people have the gall to charge money for. 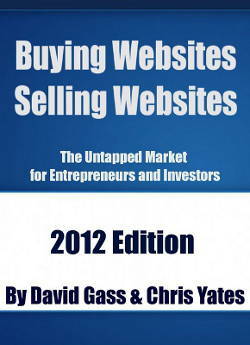 I bought the Kindle version of the Gass and Yates book, priced $2.99 from the Kindle store on Amazon.com. Buying Websites, Selling Websites, Flipping Websites is the new business venture for online entrepreneurs, investors and those looking for a second income. Online entrepreneurs buying and selling websites understand the power of this business. The world of offline real estate investing has been around for decades. Many have made millions in the market, and now a new opportunity is developing online. Online website flipping doesn’t have the hassles of all the paperwork, physical travel and inspection that offline real estate has. Learn how two entrepreneurs stumbled upon this business, how they got involved and how you can to [sic]. Discover the four methods of website investing and how to get started in the business. I had heard of David Gass and Chris Yates before because they’re fairly well-known in the MMO world. However, I had a feeling before I even got started that I wasn’t going to be impressed with this book. There were a couple of warning signs already, even if you overlook the fact that flipping isn’t new. First, the product description on Amazon described the book as having 21 pages. (The number of pages depends on what device you’re using, eg Kindle or PC app, and what your settings are.) It was 18 pages on mine. Hey, an even quicker read! And at $2.99, this meant it cost me 16.61 cents per page. This had better be good. Buying and selling websites is quite a complex matter, encompassing a wide variety of topics such as where to buy and sell, website valuation, due diligence, negotiation, as well as known scams. How on earth were they going to squeeze all this and more into so few pages? This ‘product’ is just an electronic brochure. There is no content. It contains ads for the authors seminars and links to their website. I would like a refund for this tripe! Well, most of us know that book reviews on Amazon often can’t be relied on. Perhaps that negative review was left by a competitor. I was curious enough to proceed. After all, 21 pages isn’t exactly a long read. Here’s what my 18 pages contained. Page 1 – the book cover. Well, I’d already seen that before I bought the book and it’s not very attractive anyway. p.3 – a copyright notice with a link to one of their sites. p.5 Introduction – this page briefly describes what flipping is and tells us what a great opportunity it is. If you want to learn more, then visit their website (linked to, of course). pp.6-7 Buying and Selling Website Entrepreneurs – Page 6 tells us a bit about the authors and their amazing achievements. A couple of sentences spill over onto Page 7. Much of it is talking up what they want to sell you. Crikey, we’re nearly halfway through the book and we haven’t even got started yet. At last, perhaps we’re getting somewhere now. Oops. No. I spoke too soon. Page 8 is a personal story of how they got started. As are Pages 9, 10 and 11. I think this is supposed to motivate us, but it’s really just more stuff talking themselves up about how successful they are and telling you that you could be like them too. Fortunately they’re very short pages. Can we get started now, please? Nope. This is more personal story stuff about travelling to seminars. They do mention that focusing on a clear business model leads to success. That might be useful advice, but surely it doesn’t take a book, albeit a short one, to impart it. This fluffery continues on Page 13. They ask what your focus is going to be. To find out more, you need to visit their website. (They give a link, of course.) They also recommend three books which they say are worth reading. Page 15 briefly describes the types of flippers. Ants are those who build to sell. Dolphins buy and sell. Dragons buy for passive income – and that’s what they focus on. Page 16 adds another category of whales. These are the big money guys who are often silent investors who make high returns by leveraging the time and expertise of other people. This chapter concludes with another advert for their website and the suggestion that you should attend their seminar. So, that’s us at the end now except for the bonus chapter. This chapter offers you discounts on what they’re selling. You can get $500 off the price of the summit they’re promoting if you buy within a specified time of purchasing this book. If you buy their formula from their website, you can get $2,000 off the price of the summit. Then follows a few paragraphs about them. Page 18 reiterates the same information and concludes with another plug for what they’re selling, ie their investment formula and the investment summit. They also give a plug for their “free” forum. If you look at it, you’ll see that the free forum has a ‘premium members only’ area with various payment options. Apparently the best seller costs $77 to join and subsequent monthly payments of $17. A quick look at the source code reveals that this forum appears to be powered by a WordPress plugin. Actually I don’t have a problem about having to pay for premium membership on various forums, but I digress. This is a book review. This wasn’t a book at all. It was a long sales spiel for what they’re selling. Instead of using one of these horribly long sales pages, they presented it as a book instead. And had the cheek to charge $2.99 for it. Needless to say, I asked Amazon for a refund. Maybe this is a clever way to entice people to read your sales page. Maybe they fully expect people to look at the book and then ask for a refund. But I’m not convinced this tactic is a good one. I think it could damage one’s reputation to do that sort of thing. I doubt if I would ever pay for anything from these guys again. I just felt cheated about the bait-and-switch of having bought a book and been given something else entirely. Normally I include my affiliate links for a book, even if it’s one I’ve said I don’t like. After all, not everyone agrees with my opinions, and people have bought before even though I’ve given a negative review. I’m making an exception in this case, though. There is no way I’m selling an MMO sales letter which has been presented as a book for people to buy. What do you think about it? Is it a valid marketing tactic or is it potentially damaging? Please comment! Out of curiosity, I checked out the forum. There are several bits of source code which pointed towards it being part of a WordPress installation – notably the style sheets. So it would be natural to assume (as I did at first) that it was a forum being run off a WP plugin. It doesn’t offer the usual forum facilities such as private messaging, user profiles etc. The first post in any thread has social media buttons, but none of the replies do. And instead of a “Post reply” button at the bottom, there’s an “Add a comment” button – something you’d associate with a blog, not a forum. This looks more like a blog that any registered member can post to, rather than a true forum. However, since it’s you. Here is the info you seek. Thanks for the honest review, it’s so difficult to find someone genuinely helping people and not trying to make money out of them! What is your experience with buying websites? How many websites did you buy before feeling comfortable with the whole process? Thanks for your comment. I don’t really do a lot of buying and selling websites, I mostly dabble in that, although I’ve been building them for more than 13 years. However, I’m always interested in anything about making money online, and buying and selling is quite a big part of that. I thought it was high time I got stuck into that side of the industry too. Frankly, so far I’ve not been any more impressed with most of the buy/sell material available, than I have been with the MMO snake oil. Do we know each other from somewhere? The Experienced-People forum, perhaps?